Dubbed the ultimate organic skin toner, this beautiful product contains light reflecting particles which even skin tone, giving a smooth and lustrous appearance and a naturally healthy sun-kissed glow. It contains the golden resins of frankincense and myrrh, along with nutrient rich phyto-active marine extract, which work together to tone the skin, leaving it firmer and boosting suppleness. It also has super hydrating hyaluronic acid and tripeptides which stimulate the production of collagen leaving your skin feeling smoother, softer and with a beautifully refined and fresh appearance! This, smells divine. The scents of frankincense and myrrh really pull through and they smell so gorgeous and natural. It comes in a beautiful glass pot which just squeals luxury and would be a welcome addition to anyone's dresser! 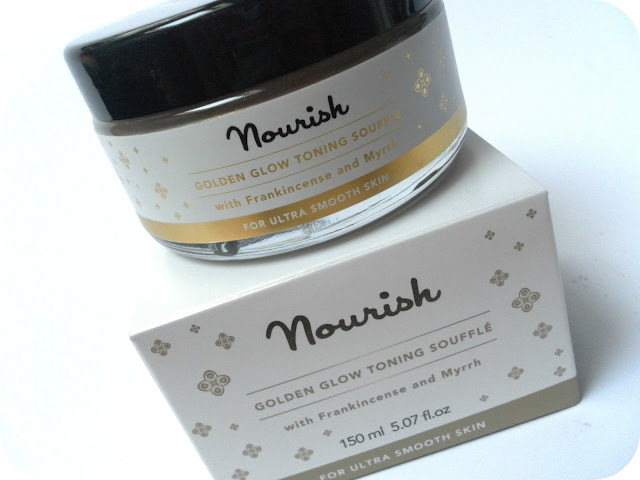 I have been using this lovely smelling souffle in four ways. Four I hear you say? Yes, four! When it arrived and I opened it up, ideas instantly flew in to my head of how to use this. The most obvious way is of course, all over! And I have found when my skin is tanned (due to the #TFWOC project which you can find here) this compliments the tan beautifully. It doesn't transfer to your clothes so you don't have to worry about any of the glimmering golden glow transferring to your clothes. 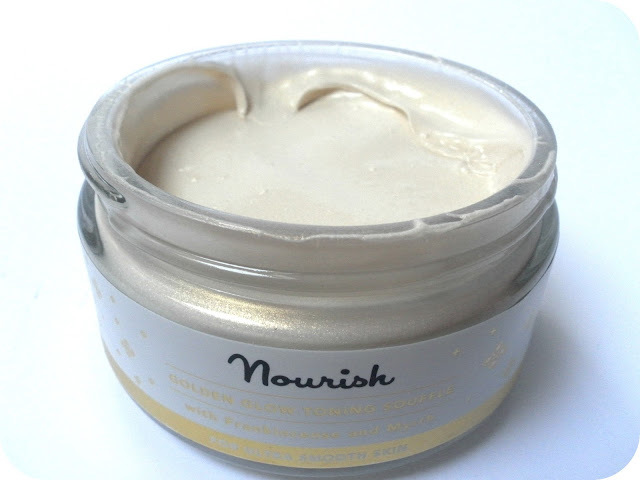 All over, it leaves a beautiful finish and compliments my tan in such a lovely way. The second way I have used this product is purely on my décolletage, which is very flattering when wearing a low cut top (in a good way!) The third way I have used this, is just a touch of it run through my hair before going out. The light reflects off of the gold glimmers and makes my hair look shiny, healthy and is very subtle (so you don't have to worry about rewinding to the 90's with glitter hairspray!) and finally, my favourite way to use this? As a highlight when applying makeup. 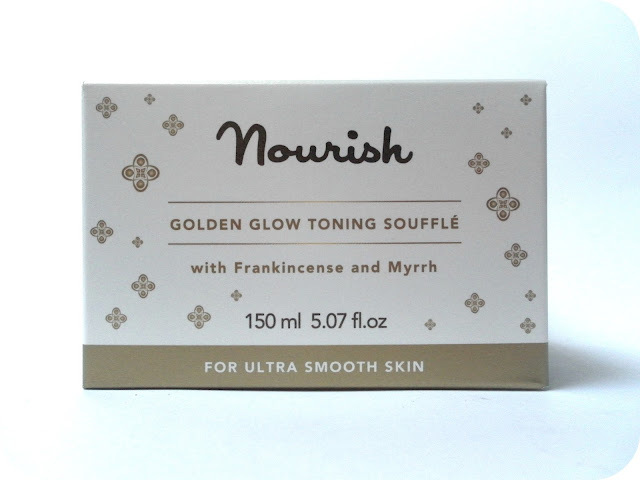 Oh my golly good gosh, it works so amazingly well as a highlight on my brow bone and cheek bones and gives the most beautiful finish. Basically, I am just utterly in love with this product which can be used any which way you let your imagination take you! A very big 150ml glass pot of this costs £24.95. A price I think is very reasonable considering the consistency is quite thin and will last you an age! This is the perfect treat for yourself, or the perfect gift for a loved one this Christmas. Wow this looks so pretty and really puts me in the spirit of Christmas lol. I love how this project can be used in different ways, great review hun! Wwow sounds truly lovely, and it has so many uses, even better! This looks amazing, and really muti use too! Great review! This is so gorgeous! I was sent one a couple of days ago and I can't wait to try it - the light-reflecting particles are lovely without being too overpowering!